Ocean Training Online in conjunction with the City of Glasgow College is to offer a new Blended Learning training programme for anyone wanting to achieve their MCA Large Yacht Certificates of Competency from Officer of the Watch level to Master. (Standards of Training, Certification and Watchkeeping) courses worldwide. been specially developed for the full MCA Blended Learning method. working engine rooms in a college in the UK. Ocean Training is very proud to be associated with this fantastic college. The combination of learning at home or at sea, anywhere in the world, together with the practical aspects of training at the City of Glasgow College make this the first ever 21st Century Blended Learning model. First Minister Nicola Sturgeon and City of Glasgow College Principal Paul Little today [Monday 26 October] unveiled a new £66m "world-class campus with the 'wow' factor" on the banks of the River Clyde. "Scotland has a strong maritime history and now 10,000 students a year will be able to come to the Riverside Campus to continue that proud tradition. Principal Paul Little was proud to welcome more than 250 guests from all over the world for the milestone event. Principal Little said: "This is a truly outstanding, world-class campus with the 'wow' factor. It represents a bold statement of intent by City of Glasgow College to lead the global maritime college community. Within that community, our Riverside Campus is now the most advanced of all colleges throughout the world. Riverside Campus enjoys a stunning waterfront location and features a ten-storey student accommodation block and a landscaped recreation area alongside workshops and classrooms that comprise state-of-the-art technology. The new marine engineering facility features Scotland's first shipping simulation suite, allowing students to experience the bridge of a super tanker, as well as nautical chart rooms and a ferry-sized ship's engine. The Marine Skills Centre also has its own jetty and free-fall lifeboat. The Riverside Campus will give up to 2000 students the opportunity to learn new skills using cutting-edge technology. Ocean Training is very proud to be associated with a college that is second to none in the maritime Industry and indeed the world. When undertaking any Distance Learning or Blended Learning course you should be sure that the provider offers proper support and guidance to you throughout including advice at the start, professional support during and guidance on completion. Many providers of "franchise" products offer little or no support. We at Ocean Training are proud that we support all our students to the highest standards through professional tutors. Because all of our tutors are dedicated to Online Training and do not run practical courses, they do not go out to sea all the time, and therefore are always ready to answer students work and queries. So when signing up for an e-learning or online course always make sure that the tutor is available to answer your assignments and questions. 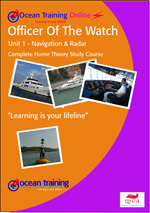 The STCW MCA course for the OOW (Yachts under 3000 GRT) is now available on our online system. It is the first of its type in the world and is proving to be of great interest. This course has taken two years of development and is brilliant - to say the least. This course has over 370 animations which really enhance the learning.The fact that you can study in your own time and place - at home or at sea - means that you will be well prepared for the MCA exams. Ocean Training Online launches the first Blended Learning course approved by the MCA - Officer of the Watch (Yachts under 3000 grt) Distance Learning course. Major revisions to the International Convention on Standards of Training, Certification and Watchkeeping for Seafarers (The STCW Convention) came into force in 2012. The "Manila Amendments - 2010" were adopted at a diplomatic conference at Manila, in the Philippines in 2010. These aim to establish a Global standard for Training and Certification of seafarers to ensure operation of technically advanced ships of the future. The Manila 2010 amendments include the introduction of modern training methodology such as Distance Learning and Web based training. Modern training for seagoing personnel includes a good knowledge of the theory combined with the implementation of the learning on a practical college basis. The combination of Distance Learning theory and college based practical courses is called Blended Learning and is the way forward in the 21st Century. Ocean Training has just been fully accredited for this Distance Learning method by the MCA for the Officer of the Watch (Yachts under 3000 gt) Distance Learning course. This is the first course of this type to be rolled out and includes two key subject areas, Navigation & Radar and General Ship Knowledge. The big advantage of learning the theory by the Blended Learning model is that a student can either study at home or on board a ship using the Internet to correspond with their own professional tutor "Earn While you Learn"
Ocean Training has been producing Distance Learning Theory courses for the Royal Yachting Association (RYA) for the last 20 years and have established a Global market for these products. All the tutors are professionally qualified. All courses include hundreds of detailed animations, which greatly enhance learning. These animations are so professional that they are used by the MCA themselves for coastguard training. Ocean Training now has over 380 animations which are included with all our online RYA and MCA courses. These have all been professionally produced and they enhance the learning greatly. As the principal Ted Miley says "The animations really enhance the learning for all our students and are the icing on the cake"
The MCA have been granted a licence by Ocean Training to use these animations for all their in house training of staff and for coastguards. That speaks volumes for the professional production and quality of the material. After learning a certain topic the student can see the animations and it really drives the lesson home. The animations are second to none and have full sound in either an English accent or an American accent. These animations include Chartwork, Tides, Collision Regulations, Meteorology, Seamanship, Safety, Electronic Instruments, Distress messages - to name but a few. Check out the samples on the home page. The MCA wished to offer a good Celestial course to enhance the taking of sights by navigating officers. This skill has declined in recent years and the quality of other Astro and Ocean courses is not considered adequate for the purpose of taking and fixing good celestial sights, and to ensure that all deck officers are fully up to speed on this vital aspect of navigation. Despite all the technology of GPS, Radar and ECTIS what do we do if all the electronic systems fail, as is too frequently the case? This is where we get hold of the trusty Sextant and Nautical Almanac and obtain good celestial sights - just as Captain James Cook did nearly 300 years ago. So, Ocean Training has taken this requirement very seriously and has produced and launched the first ever Celestial Navigation course by online learning which meets the MCA standard. Please check it out on our website. Ocean Training Online has launched its new Officer of the Watch (OOW Yachts under 3000 tons) course at the Monaco Boat Show in October 2013. This course is a unique opportunity for students to gain MCA qualifications while on board ship or at home. 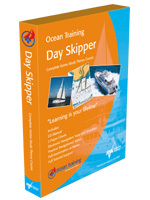 This ground breaking course means that you can learn while you earn on board a vessel at sea. The elements include the MCA Navigation & Radar course and the MCA General Ship Knowledge course. The MCA course means that you learn all the theory this way and only have to attend a nautical college for the practical subjects. By this method considerable savings can be made as you will not have to pay for accomodation or travel to study these options. Its a great way to "Earn While you Learn"